We’ve discussed at length how much we adore Taylor Swift’s killer fashion sense. T-Swift pretty much always dresses to the nines, but since she’s been spending more time at her NYC home, we’ve been even more impressed with her fall looks. From grunge-inspired plaid on a casual day out in the city, to a gorgeous knitted dress and trenchcoat combo while on a dinner date with BFF Cara Delevingne, we’ve been consistently in awe of Swift’s cooler-weather sartorial choices. 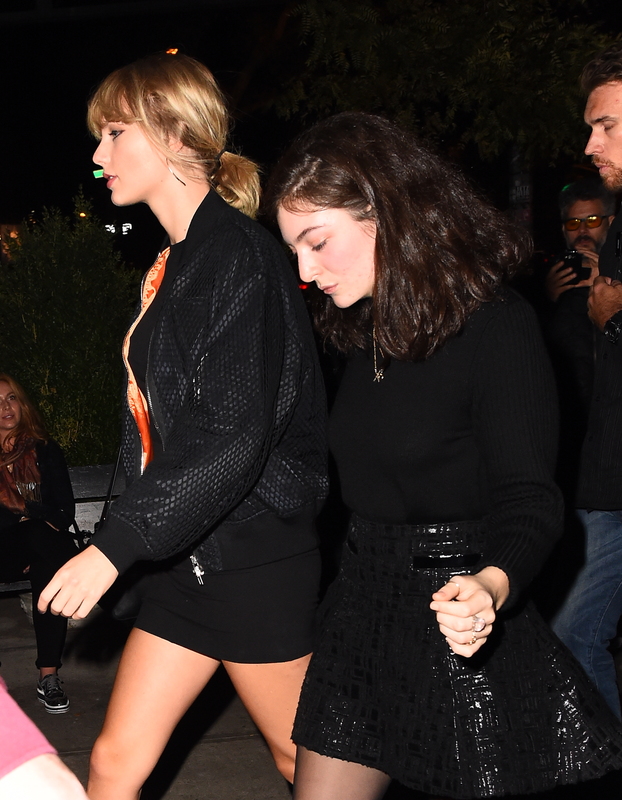 With her latest instantly-iconic look, T-Swift rocked an all-black outfit while out on the town with her squad last night. Swift stunned in a black top and skirt, with matching black accessories including heeled lace-up boots, a black shoulder bag, and a BOMB black bomber jacket (pun so very much intended). According to what PEOPLE Magazine had to say about the classic city-dweller look, the boots were Stuart Weitzman, the bag was from Elizabeth and James, and the bomber jacket was from Alpha Industries, an authentic flight jacket company that supplies the military. Swift debuted the look while hanging out with Cara Delevingne, Lorde, Dakota Johnson, and Suki Waterhouse. The group went to dinner before heading out to a private Kings of Leon SiriusXM concert at (Le) Poisson Rouge. Here’s a closer look at the cool jacket. We love the semi-reflective, almost snakeskin-like pattern. And here it is from another angle, where you can really see the pattern up close.